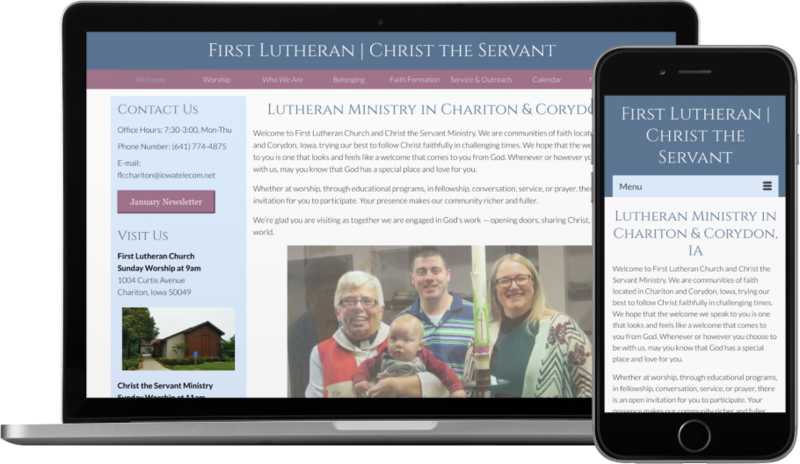 First Lutheran and Christ the Servant are two faith communities, one in Chariton and the other in Corydon. They share one pastor, and one website. Church websites are unique because they have two different primary audiences: members and visitors. The members use the website as a hub of information, watching to see special announcements about upcoming programs, meetings, and more. Visitors mainly want to know the denomination of the church, what time worship takes place, and how to locate it. The website aims to provide an open and friendly welcome to both, with an emphasis on being easy to navigate.